A recent survey shows that people want self-driving cars to be programmed to minimise casualties during an accident, even if it causes the death of the rider. Trouble is, the same survey shows that people don’t actually want to ride in cars that are programmed this way. That’s obviously a problem—and we’re going to have to get over it. These are the kinds of thought experiments that are taught to Ethics 101 students during the first weeks of class—but now they’re actually being applied to real life. Similar to the vexing trolley problem, manufacturers are struggling to come up with new rules for autonomous vehicles to guide them when an accident is inevitable, and the lives of people, both inside and outside of the car, are at stake. 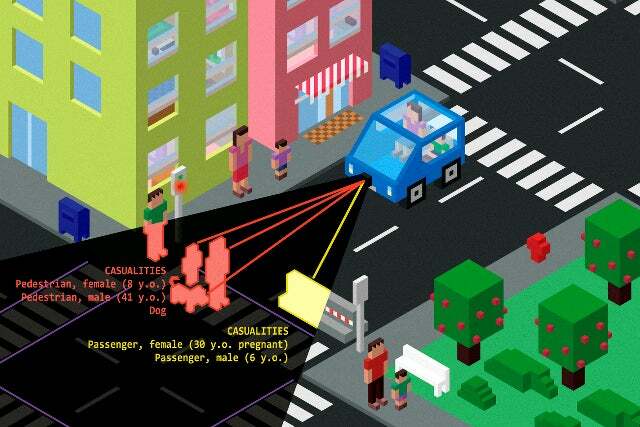 A new study published in Science shows there’s a big disconnect between the kinds of ethical programming we want these vehicles to have, and the kinds of cars we actually want to ride in. Surveys done last year demonstrate that people tend to take a utilitarian approach to safety ethics. That is, they generally agree that a car with one rider should swerve off the road and crash to avoid a crowd of 10 pedestrians. But when the survey’s respondents were asked if they’d actually ride in a vehicle programmed in this way, they said no thanks. The researchers call this a “social dilemma” whereby consumer choice—and the urge to act in one’s own self-interest—could make road conditions less safe for everyone. Frustratingly, there’s no known way to design a cake-and-eat-it-too algorithm that reconciles our moral values and the understandable human desire to not die. Results of the survey showed that people are on board with utilitarian-minded robotic vehicles, and would be content to see others buy them. This is an easy sell; the needs of one or two individuals, we tend to agree, is greatly outweighed by the needs of the many. The more lives saved, the more inclined people are towards this utilitarian attitude. As shown in the survey, as many as 76 per cent of respondents were cool with a vehicle being programmed to sacrifice one passenger if it meant saving the lives of 10 pedestrians. But these same people showed considerably less enthusiasm when it came to their desire to purchase or ride in one of these autonomous vehicles. 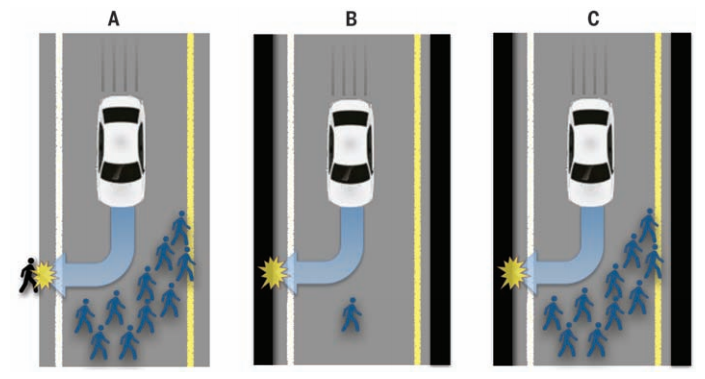 When asked to rate the morality of a car programmed to crash and kill its own passenger to save 10 pedestrians, the favourable rating dropped by an entire third when respondents had to consider the possibility that they’d be the ones riding in that car. The study also revealed that people don’t like the idea of having the government regulate the auto industry to enforce utilitarian principles. Respondents were only a third as likely to purchase a vehicle regulated in this way, as opposed to an unregulated vehicle, which could conceivably be programmed in any number of ways. Patrick Lin, the director of the Ethics + Emerging Sciences Group at California Polytechnic State University, says we humans are a fickle lot, and that we don’t always know what we want or what we can live with. What’s particularly bizarre about this latest research is that many of these survey respondents, should they find themselves in a situation where they’re driving a car and are suddenly confronted with a similar situation, would probably go out of their way and make a suicidally evasive manoeuvre to avoid a crowd. There appears to be a bit of a disconnect between the morality of human decision-making in these matters, and having robots make these decisions on our behalf. We’re clearly uncomfortable with it, but we’re going to have to get over it if we ever want to see safe and responsible self-driving vehicles on the road.